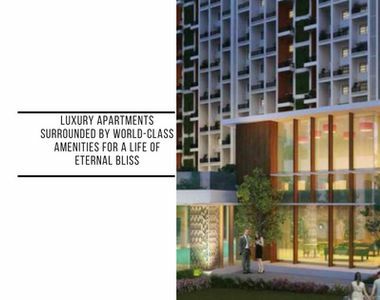 Luxury apartments surrounded by world-class amenities for a life of eternal bliss! Pune offers a pollution-free healthy life that is loved by many. This city is known for its social infrastructure, education and IT hubs, green environment and so much more. The real estate sector in Pune has grown over the years with a number of residential as well as commercial projects. Competition between real estate companies has doubled today. Godrej Elements is a magnificent residential project in Pune by Godrej Properties Limited that offers supreme luxury and comfort for a life of pure divinity! Spread over a land of 7 acres, this residential development contains plush towers that offers beautiful variants of 2BHK as well as 3BHK apartments that are designed for the highest level of luxury. The apartment carpet area sizes start at 52 sq. m. and go up to 103 sq. m., offering ample amount of free space that you will never run short of! Godrej Elements Pune is a beautiful development that offers the finest internal and external amenities for a comprehensive lifestyle! You will find apartments that are well-spaced, provide beautiful natural lighting, air flow in every room and contain, high-quality flooring, branded fittings & fixtures, large doors, wide balconies and windows providing landscape views, stylish modular kitchens with RO purifier, piped gas and multiple provisions, futuristic home automation, IP series video door phone, multiple safety features and more. When it comes down to external amenities, this development offers the best of the best! This development is where you will find fabulous amenities for individuals of all age groups. The external amenities include a grand clubhouse, meditation centre, well-equipped gymnasium, swimming pool, multiple sports facilities, dedicated basketball and tennis court, play-area for kids, amphitheatre, multipurpose hall, landscape garden, wide open space that will always make you feel free, vehicle and visitor management system, geo tags for your kids, solar water heating system and high-end security with video surveillance for total security. Without a doubt, this development is packed with outstanding features that go way beyond the basics! Situated at Hinjewadi in Pune, Godrej Elements Hinjewadi offers a convenient lifestyle as it has a number of places and landmarks in its vicinity! From schools and colleges to medical centers, hospitals, malls, cinemas, supermarkets, retail outlets, shopping centres, general stores, cafes, restaurants, clubs, pubs, IT parks, entertainment zones, banks, ATMs and more, no place is hard to fins when residing at this location. Convenience is a major element in modern-day living and Godrej Properties Limited offers it in plenty! Starting at an excellent price of Rs.72 lakhs and moving up to Rs.1.51 Cr, the apartments at this development are economical and totally worth your savings or a new home in Pune. In fact, this is an ideal development for investors as well! Godrej Properties Limited has always focused on affordable housing and this development is no exception. Choose from a variety of payment plans along with home loan facilities through associated banks, NRI services, customer support and more for a stress-free purchase. Book your apartment today and let the essence of luxury unfold!